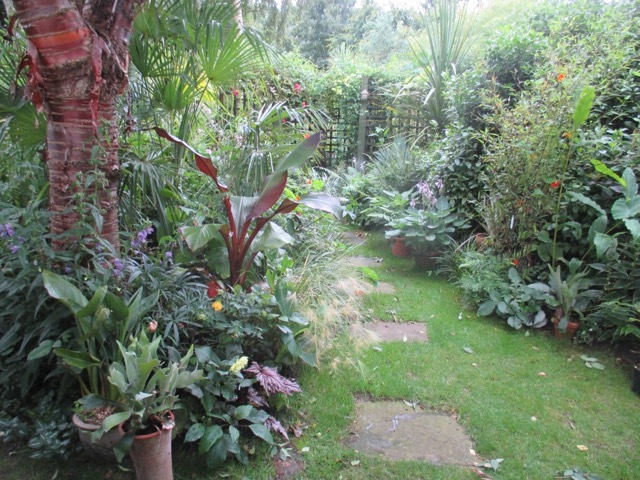 I think I may have inadvertently invented a new verb - 'to exoticise', meaning to change part of a traditional garden to one with densely packed planting giving a sub-tropical feel. Anyway, that is mostly how I have been spending my time over this season, and it has been a massive learning curve. I know I have not got it right yet, but it has been enjoyable learning about new methods and new plants. My partner has been gardening in this way for about fifteen years, so I have my very own maister to guide me. In some ways it is easier than traditional gardening, as mistakes can be rectified more easily. Most of the tender stuff is wheeled out every year, after the threat of frost has passed, and placed in position before planting. In a way it feels more like flower arranging, as you can move the pots around to get maximum effect, before planting them, so you can try arrangements out and improve them very easily. I find the difficult bit about traditional gardening is that it just seems right and then a week later it CHANGES, due to plants dying back after flowering ! So many perennial plants look superb at the back of the border for a few weeks, then they inevitable finish flowering and fall into a rapid downward spiral of decay before finishing with a vanishing act. Then there is a hole in the border, and something else is needed to take over. A bit like spinning plates, it is an art to keep them all going. The majority of plants in this brave new world of exotic planting stay the same. You plant them. They get bigger. They may flower. They get bigger. You protect them at the end of the season. There is little staking, cutting back or bringing in replacements. They just stay the same. Bananas, palms, hedychiums, calocasias, cannas, dahlias, yuccas and lots of others, need little attention once they are planted. 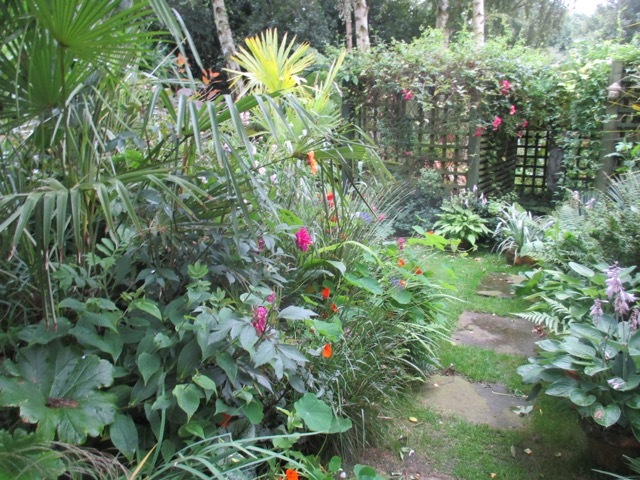 The bit of garden we have exoticised was o.k. before we did it ... nothing special , but it was o.k. 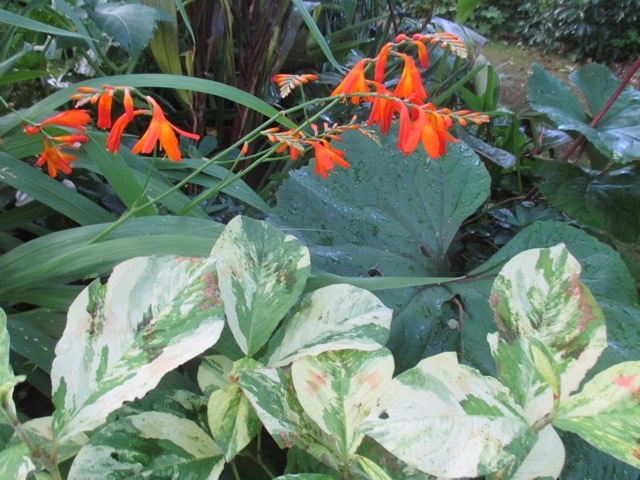 It had forgiving shade tolerant planting like ferns and hostas, but I never felt I had got it right. I grew things that survived easily there, like hellebores and castor oil. 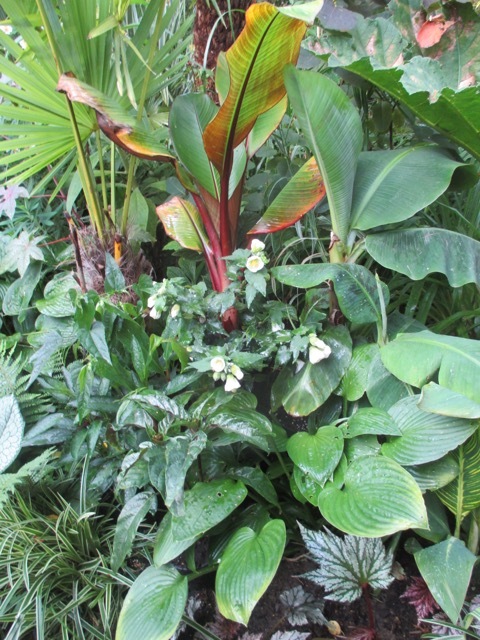 Once we took the decision to exoticise, we realised that a lot of the current planting would complement an exotic look, giving a hardy backbone, which could remain permanently in position. 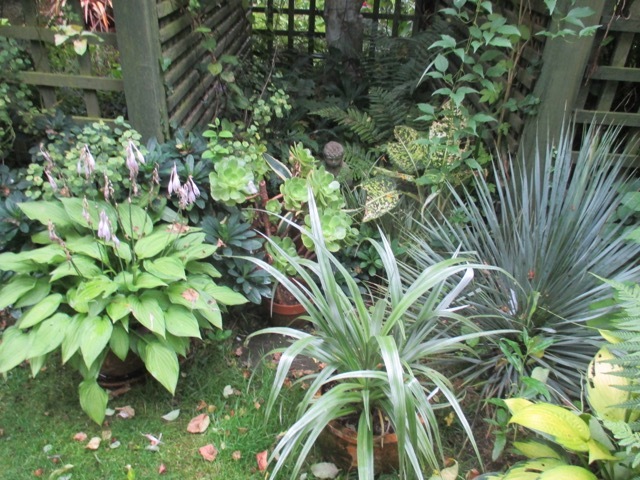 In March we drew up a long shopping list for big plants - palms and tree ferns which we took to 'The Urban Jungle' near Norwich, and 'Evergreens' in Beccles. We needed a van to deliver everything we bought. 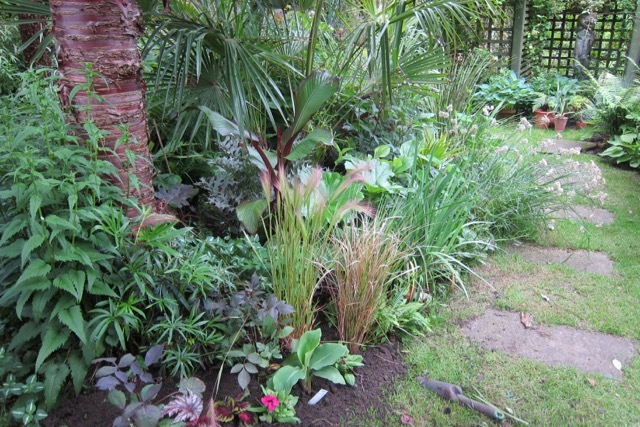 Getting the big chaps planted was hard, miserable work in the cold days of March, and when we finished, it was incredibly disappointing as it didn't look sub tropical or exotic at all - it just looked like a suburban garden with a few palms dotted about in the mud. Once the threat of frosts had passed we started planted out all the tender stuff. I grew lots of it from seed, so plants were plentiful and cheap. I grew 5 different varieties of Ricinus, Tithonia 'Torch', nasturtium 'Empress of India', Amaranthus 'Velvet Curtain' and 'caudatus', cactus dahlias and dahlia 'Redskin', swiss chard 'Bright Lights', and Begonia 'Illumination'. Again, the annuals looked nothing when they were first planted out, as per usual. Despite all the nurturing and care needed to produce these young plants, they are so small they get lost in the garden until they start to put on growth. It is a real act of faith to plant them out as they look absolutely nothing initially, and it is hard to believe how much they will grow in a few short weeks. They are really filling out now, as they have established themselves. Some of the annuals have been more successful than others and the Tithonias and Ricinus are now just about the same height as me. The nasturtiums have scrambled and climbed through the planting so that there are flowers, like little beacons, in unexpected places. 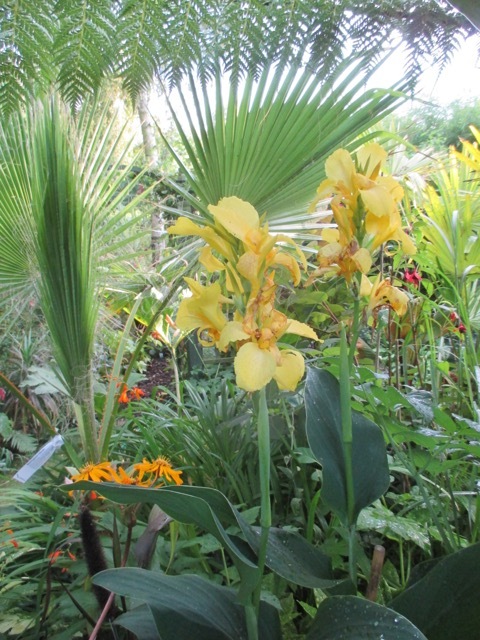 I am told that the key to successful exotic gardening is a good balance between tender and hardy so that a solid backbone remains in the garden throughout the year, while gaps are filled with colour and exotic foliage supplied by the tender plants. 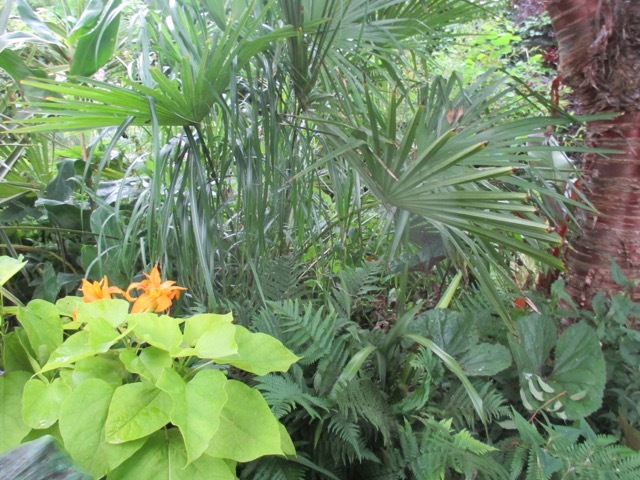 Some good hardy plants which add to a tropical feel are Euphorbia, Castor Oil, bamboo, ligularia, tall grasses like Miscanthus, Inula, gunners, rheum, ferns, hosts, cotinus, crocosmia, crambe cordifolia, cardoon, aucuba, some yuccas ... the list is endless, and is mainly dependent on foliage which complements an exotic look. 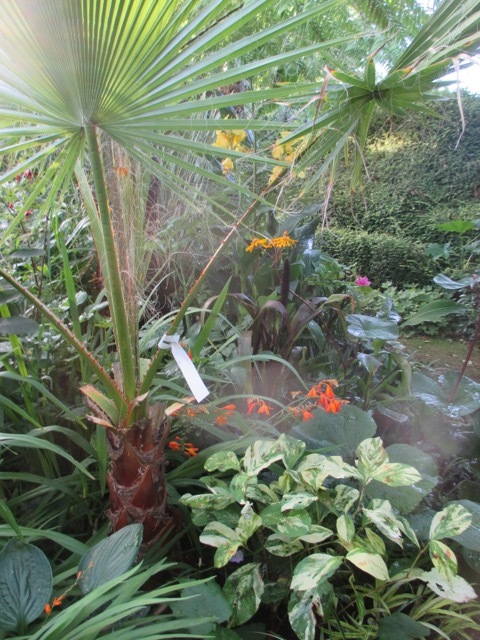 Trachycarpus Fortunii is a very hardy palm and can cope with temperatures as low as minus 17. Ours got through the terrible winter of 2010 unscathed. Hardy exotic looking flowers include lilies, hemerocallis, clematis, anenomes, bergenia, irises, crinum, ligularia, Inula and Phlox. The next group is plants which will be hardy through most english winters, but may need protection in really severe weather, and include, cordylines, hebes, brunnera, Tetrapanax Rex, Musa Basjoo (banana), some eucomis and phormiums. They remain in the ground and will be fine unless the temperature drops very low (below around minus 8). Some may lose their leaves but are root hardy. This is knowledge we have gleaned from our own little micro-climate, and so will not necessarily be true elsewhere. We also learned very quickly that young plants need more protection and care than established, more mature ones. The next major group is the tender group, which need to be kept frostfree all winter, and can only be planted out once all risk of frost is over. 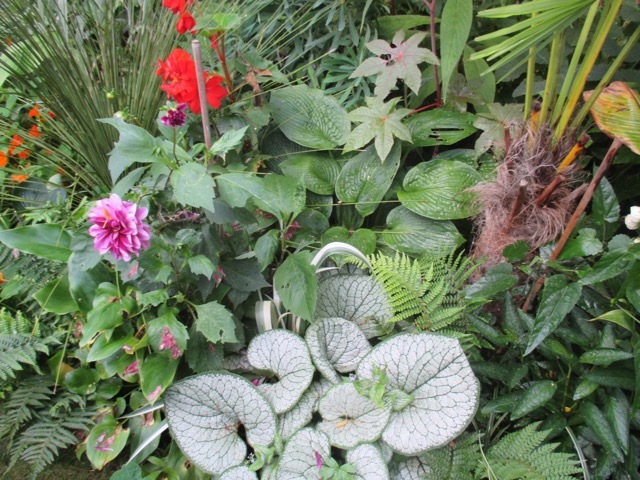 It includes dahlias, calocasias, alocasias, hedychium (gingers), Ensete ( more tender banana), abutilon, salvia, agave (will stand low temperatures but hate to be wet), aeoniums, some eucomis, begonias and persicaria. Some of these will need a heated greenhouse in the coldest weather. There is another group which includes plants which stay in the ground but need protection to ensure their survival. Some are left mainly because their size makes it impractical to overwinter them inside. 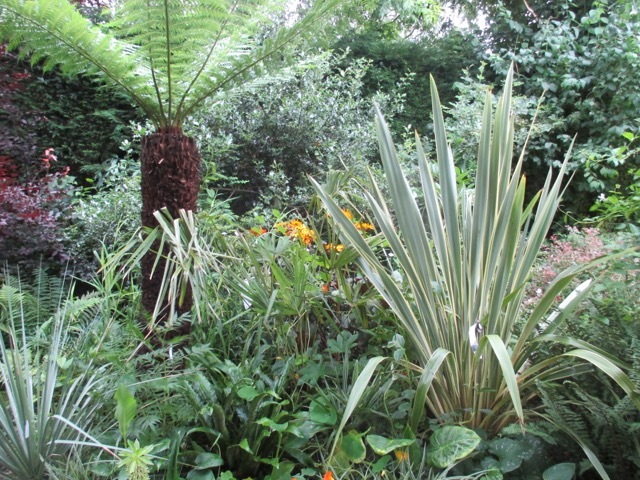 They include tree ferns ( ours wear a jaunty cap made of chicken wire and stuffed with straw), some palms and some bananas. Annuals make up another group, and the choice is fantastic ... coleus, nasturtium, tithonia, begonia, amaranthas, ricinus, cosmos, salvia, and zinnias for starters. While the majority of planting can be accomplished using plants which are both easy to acquire and propagate, it is always enjoyable to have some which are more unusual. 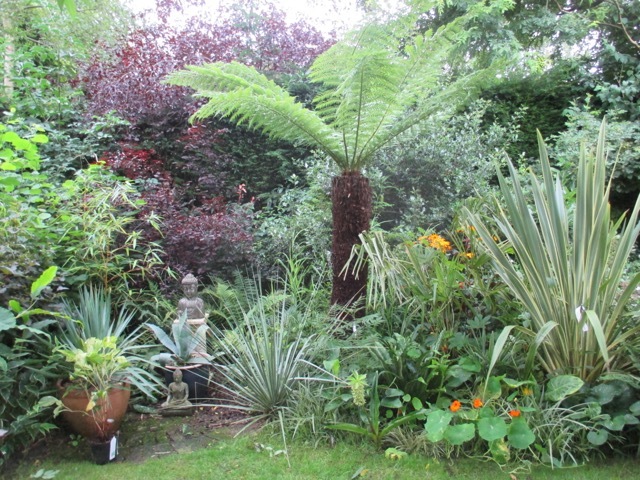 The tree ferns come into this category and lend a special atmosphere to the garden. We have also acquired a couple of Astelia (silvery, spear shapes leaves), Daisilirion (spikey, very spikey! 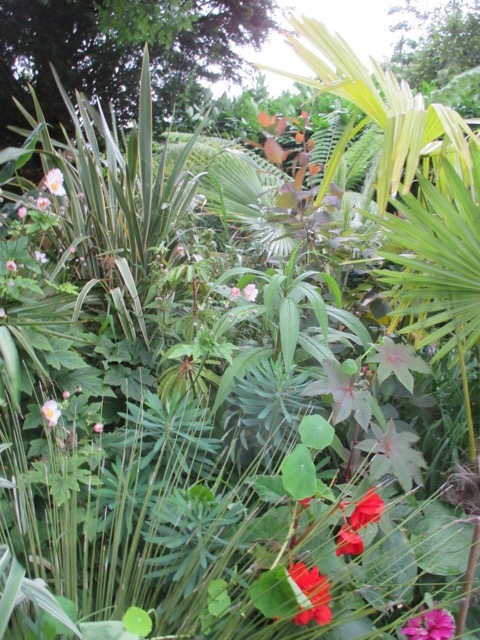 ), Yucca Rostrata, Podophyllum Versipelle 'Spotty Dotty', Tetrapanax Rex, Catalpa, Pawlonia, Agave Montana and Begonia 'Angels' (like Begonia Rex but will take lower temperatures). Two bamboos have been added - a lovely golden caned Phyllostachys Viva Aureoulis and the black 'Nigra' too. 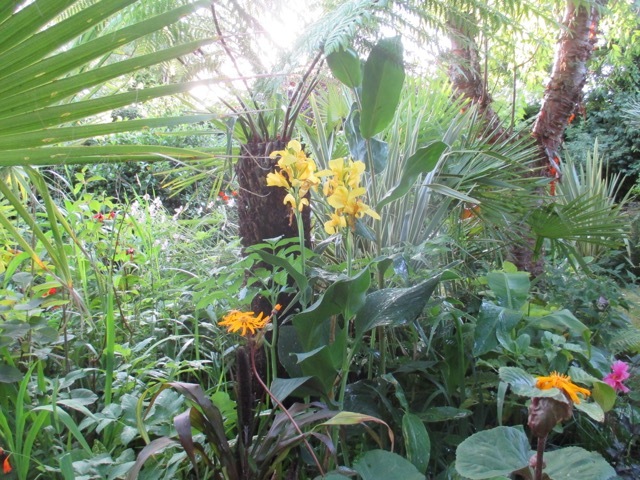 An additional benefit of a sub tropical garden is that it reaches its peak late in the season, when a traditional english garden is beginning to wane. It really seems to extend the gardening season, as it is still improving at this time of year, and looking extremely fresh and lush. I am definitely NOT looking forward to autumn, however, as there is the hard work involved in dismantling the exotic bits, and lugging all the tender stuff under cover! I love your jungle. I think it is worth all the extra work...if you like to do that. It is like being in an exotic place. Thank you Lisa. It is a work in progress !! It's looking great but you must have a huge greenhouse to overwinter every thing and do you heat it? We have a greenhouse and a conservatory Sue, and both are crammed to the rafters ! We do heat both as it would be false economy to take any chances with the tender stuff. 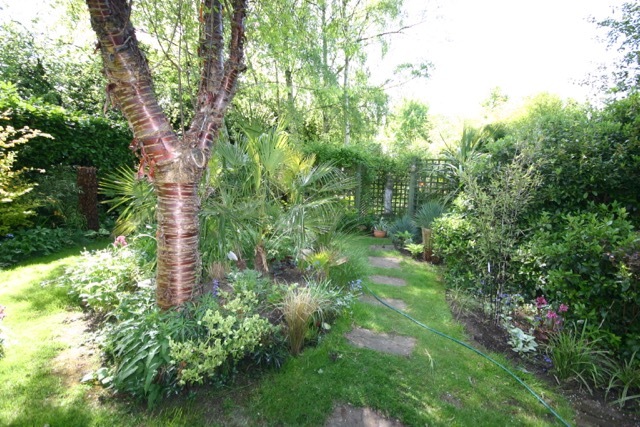 Hi Jane, looking at your garden, I think you are on a very exciting journey excotising (love that word) it! I have to admit I love traditional English Gardens, but I always have seen them in the beginning to the middle of June, when my husband and I come over for vacation to England. I guess that is the time when they are on their peak. You might really have a point that they perish after that point whereas your garden is still wonderful to look at. 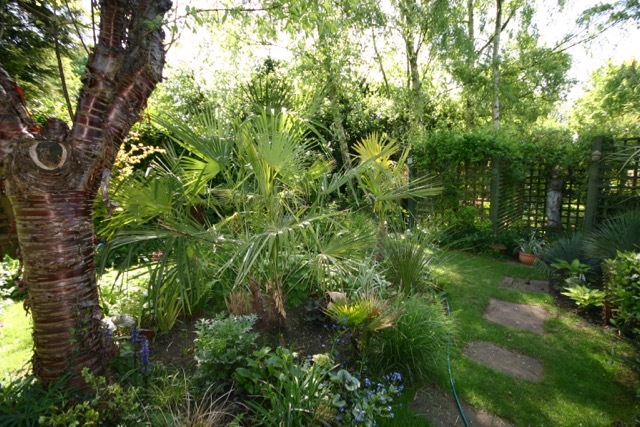 I love that lush green look and I love palms, tree ferns, yuccas etc. anyways. I was wondering why your garden looks so lush and I think it is simply because you are planting to densely that no bare soil is there to be seen. That is something that I should strive for in my own garden. It looks like you have been doing a very exciting experiment and you have succeeded. Simply wonderful! Hope it is not too much trouble to dismantle your jungle once cooler temperatures set in. Let us know how it goes. Ah, Christina, in sunny Southern California!! I bet you can grow some fantastic stuff with your climate ! 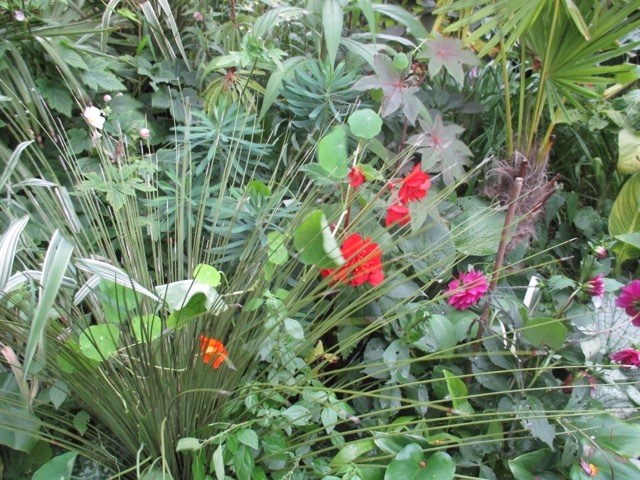 We have to battle the rain and the cold, which lots of the exotic plants dislike ! 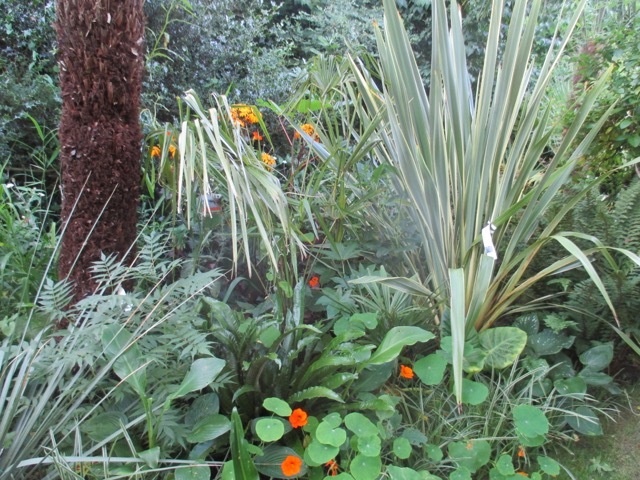 I think you are right about dense planting being the key, and also about the effort required to dismantle it all! 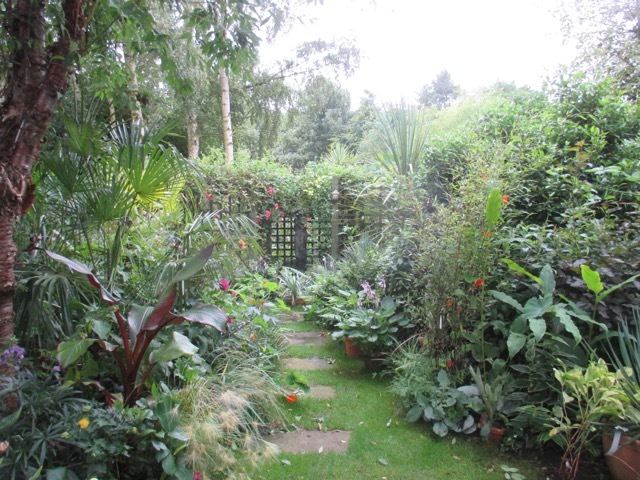 You and her husband must see our English gardens at their very peak in June - it is a perfect time for them ! I am following your example this year, instead of having all the exotics in one bed I have blended them into the main borders. I was given many hedychiums last Autumn, I have never grown them before and look forward to seeing them flower. There are two different types although I don't know what they are! Interesting Brian, how are your borders working out, do you feel? Do you like the mix of exotics and traditional together? It is my first year for Hedychiums too, so it is a bit of a learning curve. I think I was expecting more growth from them, but maybe I am not being realistic. Have yours put on lots of growth yet ? They were very slow to get going, I wasn't sure how many of them had survived the winter. If I have any flowers I will post some pictures! You obviously are a 'natural' at exoticising. The results are very impressive. I would like to exoticise but have no storage place for plants in winter. Thank you for your comments Alain. Sadly, storage space is a must in our climate ! I have very few places to store all those plants, as well, so the exotic look doesn't work for me. But what you've created is wonderful! Thanks Tammy ! I think this new - to - me style of gardening is a cross between flower arranging and weight lifting!! It does look glorious. I often wonder whether I could get away with more exotics in Devon, but we're in a valley (possible frost pocket) so probably not. I have kept a ginger for a couple of years now. But I am too much of a lazy gardener to be moving things in and out of cover. Even my one dahlia I forgot about over winter! Ha ha ! I always forget something vital too ! I believe some of the gingers are hardier than we tend to think. 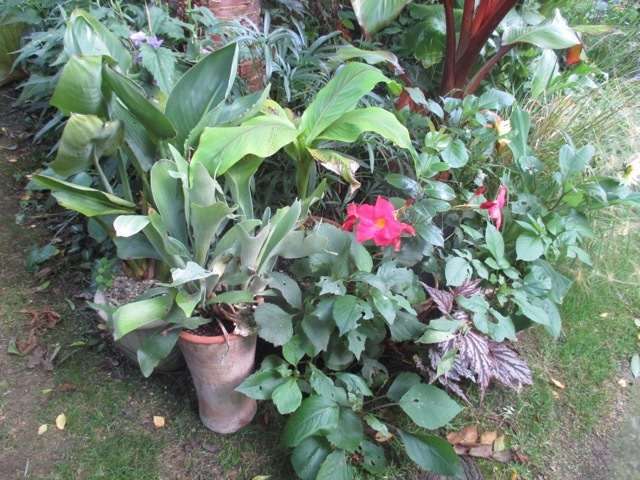 My sister lives in Devon (not in a frost pocket) and I always covet the gentler climate - she leaves geraniums etc outside. Less hardy things are moved to the greenhouse or conservatory - both heated. Most things are planted out , unless I have bought them very recently, in which case they will stay in pots until next spring. I really relate to the principle of having pots at the ready, to fill gaps in the border. I have seen Monty Don doing this with dahlias, and it is such a good idea to plug the gaps.I am hoping to try it out, too, next season, and keep some pots back until late summer, as that is when gaps start to appear in my borders. Looks good, especially that hardy palm! 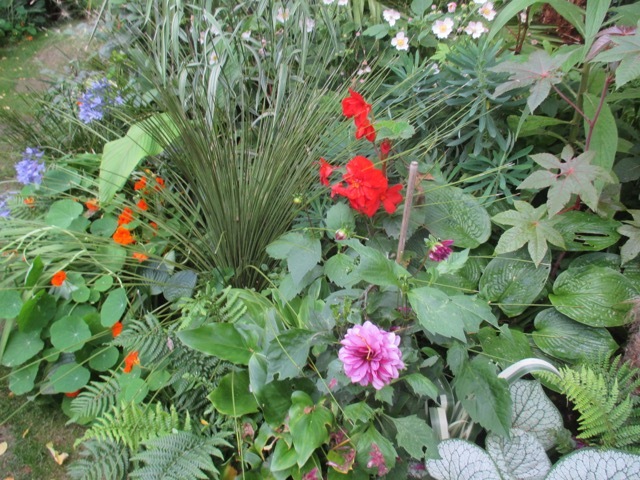 And very true about the need to mix perennials with annuals, tropical or not. You really have an amazing eye for mixing different types of flora which result in such beauty.